Guruji Narendra Babu Sharmaji narrated the below story yesterday in his Bruhat Brahmanda Programmes as yesterday was Bhagiratha Jayanthi. I like to share the story with you all. King Sagara waited in vain for the return of the princes who had gone in search of the sacrificial horse. After some days he called his grandson, Amsuman, and said: "I am anxious to know what has happened to the princes who went to Patala. You are brave; go thither, well-armed and find out what has happened and come back crowned with success." When in due course Amsuman entered and went round Patala he was delighted when he found the sacrificial horse grazing contentedly there, but was perplexed and distressed when he saw heaps of ashes all over the place. Could they be all that remained of his valiant uncles? Garuda, the bird-king, brother of Sumati, Sagara's second wife, who chanced to be there told Amsuman: "Those ash heaps are all that is left of the sixty thousand sons of Sagara who were consumed by the wrathful glance of Sage Kapila. Dear child, take the horse and complete the yaga. If these ashes are to be watered according to custom so that the souls of the princes may rest in peace, Ganga should be brought down here from the land of the Devas." Amsuman rushed home with the horse and told the king all that he had found and learnt. Sagara was immersed in sorrow at the fate that had overtaken his sons. However, the horse having been brought back, he completed the yaga. Grieving over his lost sons and despairing of ever bringing Ganga down to the nether world, he died disconsolate. According to the Ramayana, Sagara lived for 30,000 years. Figures like 30,000 and 60,000 need not confuse us. Thirty thousand may mean either a very large number or just thirty. If we so like, we may take these figures literally. Amsuman succeeded Sagara as King of Ayodhya and was, in turn, succeeded by Dilipa. Bhagiratha came after Dilipa. Amsuman and Dilipa though happy and blessed in other respects, died grieving that they were unable to bring Ganga to Patala for the salvation of their forefathers. Bhagiratha was a valiant king. He was childless. Desiring progeny and hoping to bring Ganga down, he left for Gokarna for performing penance, leaving the kingdom in the hands of his ministers. Bhagiratha went through severe austerities. With fire on all sides and head exposed to the hot sun, and taking food but once a month, he continued his tapas. Bhagiratha's name has come to signify great perseverance in any good cause. Brahma, pleased with the tapas, appeared before Bhagiratha and asked: "What would you have?" Bhagiratha told him two wishes: "If you have pity on me, bless me with a child to continue the line of my forebears. Secondly, cursed by Kapila Muni, my ancestors lie a heap of ashes in Patala. The ashes should be washed by the waters of Ganga so that their souls may ascend top heaven. May you be pleased to order Ganga to go down." Brahma replied: "The Devas are pleased with your tapas. You wishes are granted. But there is one difficulty. The earth cannot withstand the force of Ganga's descent. Siva alone can stand it. Therefore direct your penance and prayers to him." Bhagiratha renewed his tapas and continued long without food or water, and at last won Siva's grace. Siva appeared and said to Bhagiratha: "I shall fulfil your wish. I shall receive Ganga on my head. May her grace be upon you." 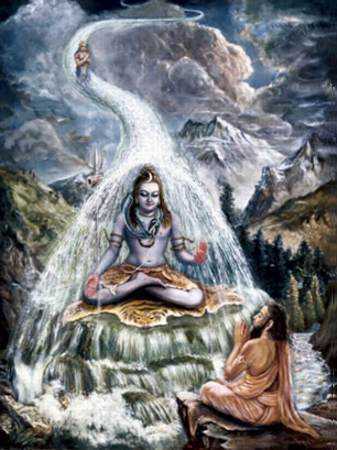 When Mahadeva promised help to Bhagiratha, Ganga began her descent as ordered by Brahma. In her arrogance, she thought she would fall on Mahadeva's head and sweep him away towards Patala. The three-eyed God decided to teach Ganga a lesson. And the moment he willed it, the flood of waters that fell on his head were held by his matted hair as in an infinite receptacle. Ganga tried her best but not a drop could emerge from the tangled maze of Siva's matted locks. This was a lesson to Ganga to be sure, but a heart-braking disappointment to Bhagiratha. There was nothing for him but to propitiate Siva with tapas. 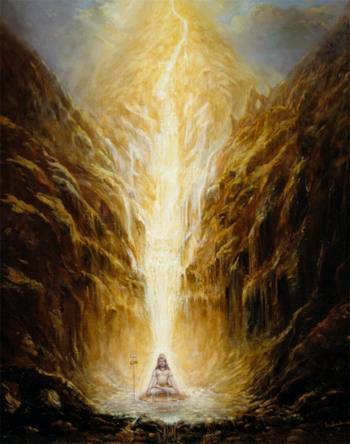 This he did to such good purpose that Siva took pity on him and gently let out the waters of Ganga in Bindu Saras from where they flowed down in seven small separate streams. Three of them flowed west and three east; and the seventh river followed Bhagiratha who was full of joy at the approaching salvation of his ancestors. Ganga followed Bhagiratha's triumphal chariot; the waters danced and shone like lightning flashes as the river made its course and the Devas and Gandharvas assembled above to witness the grand sight. Sometimes slow and sometimes fast, now sliding down and now jumping up, the river went on dancing behind Bhagiratha's chariot and the folk of heaven enjoyed the sight all the way. On her course, Ganga damaged the yaga platform of a rishi by name Jahnu. The rishi took the entire flood in his palm and sipped it off. Ganga disappeared again and Bhagiratha was sorely perplexed. The Devas and other rishis approached Jahnu and begged him to forgive Ganga and allow Bhagiratha to reap the fruit of his great austerities and perseverance. The sage relented and let Ganga out through his right ear. The Devas were glad and blessed Ganga thus: "Coming out of the rishi's body as out of your mother's womb, you are now Jahnavi, Jahnu's daughter." There was no further hindrance or mishap and Ganga reached Patala through the ocean. With the holy waters, Bhagiratha performed the funeral rites for his arcestors and secured for them their entry to heaven. Bhagiratha's efforts having brought Ganga down, she is known as Bhagirathi. After concluding this narrative, Viswamitra blessed the princes. "The sun is setting," he said. "Let us say our evening prayers in the waters of Ganga whom your ancestor brought down to this world." Those who bathe in the holy waters of Ganga or read or listen to this divine story with devotion, will be cleansed of sin and endowed with virtue, strength and unflagging zeal. Its close to the Authentic version ,thank you, I Believe that the truth should be said to people,misleading the people is not acceptable. Thank you!!! your doing a good job. Shri Anand Guruji also narrated the above story in his Pranavam programme telecasted in ETV Kannada Channel while speaking on Goddess Ganga.